Cataracts affect most commonly the elderly. Cataracts cause slow loss of vision and this makes it difficult for the patient to be aware that they present. Cataracts are defined as a clouding of the lens inside the eye. 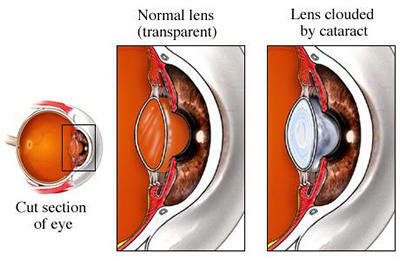 In medical terms this is defined as the non replacement of the fluid inside the lens naturally, causing the normally clear liquid becoming stagnant and murky in appearance. Cataracts are diagnosed by an Optometrist. Options of cataract surgery are offered at the stage where vision loss interferes with the patient’s lifestyle.